My card today features the January release stamps Paris Postmark and French Sentiments. I went neutral with my background, stamping the Paris Postmarks onto kraft card stock, and adhering it to a kraft A2 card. Before I adhered it, I dyed the edges of the card front with Blueprint Sketches distress ink, and added a satin ribbon and double looped bow. 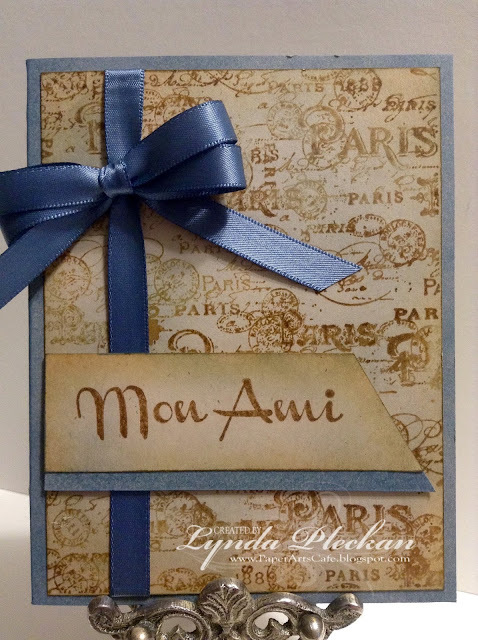 I stamped the Mon Ami (My Friend) from the French Sentiments set, onto a kraft card stock scrap, mounted it onto a piece of some dyed blue to match the card front, and adhered with foam tape for dimension. I also distressed the edges of the main panel and this piece with vintage photo distress ink. My middle school granddaughter takes French, so she was able to tell me what the sentiments in the French Sentiments set say. 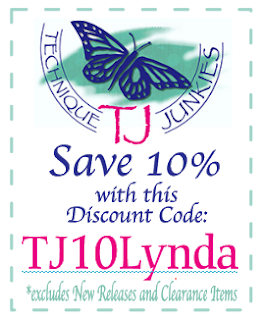 Did you know that you can get a 10% discount on these or any stamps in the Technique Junkies line by using my code, TJ10 Lynda, at checkout? Bon shopping! Hope you were inspired by my card.